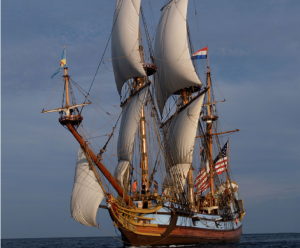 The City of New Castle has the honor to host three Tall Ships this fall. Come to New Castle to explore the ships and this unique and historic town. 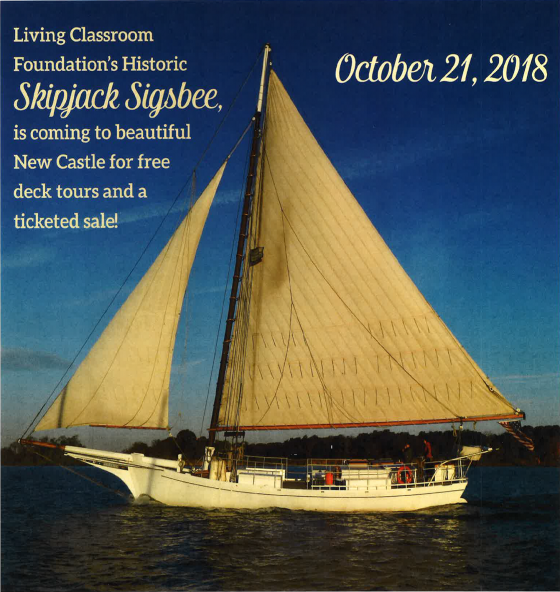 Historic Skipjack Sigsbee sails are cancelled due to high wind, but free deck tours are still being given. Enjoy a relaxing afternoon at Battery Park and sail from the peaceful, historic port city of New Castle. Help the crew raise the sails and navigate the boat, enjoy some science activities or just relax with your own libations and enjoy the tidal river sounds and vistas. You are welcome to bring your own food and drinks. Reservations are a must. Click on picture for flyer. Free Deck Tours from 11:30 a.m. -2:00 p.m.
Family-Friendly Sail Time: 2:00 p.m.- 4:00 p.m. Ticket cost: $15 Kids, $25 Adults, $20 Seniors. Capacity is limited. Sigsbee is visiting New Castle as a part of the boat’s education mission while visiting with PA, DE and MD schools. All money generated will go to underwrite the boats educational programs. Visitors with limited mobility will be accommodated as best as we can. Due to its historic design, this Chesapeake Skipjack is not ADA accessible below decks. 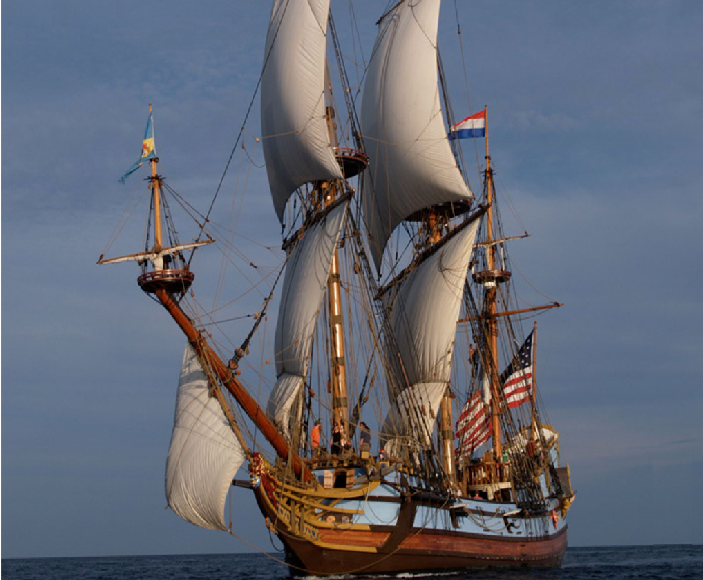 We will post more information on the Kalmar Nyckel visit as it becomes available. The City of New Castle welcomes the A. J. Meerwald. The Schooner A. J. Meerwald is the Tall Ship of New Jersey. Friday, October 26th – 5:30 p.m.
Saturday, October 27th – 1 p.m. & 4 p.m.
Sunday, October 28th 1 p.m. & 4 p.m. Enjoy a relaxing evening at Battery Park and on the AJ Meerwald! Sail from the peaceful, historic port city of New Castle. 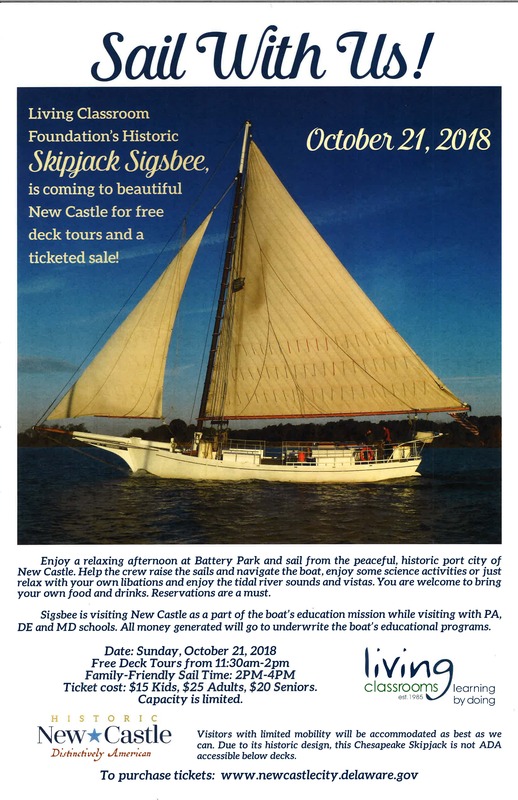 Help raise the sails, learn about the Delaware Bayshore and its maritime history and ecology or just take in the scenic, waterfront park and historic city street-scapes.